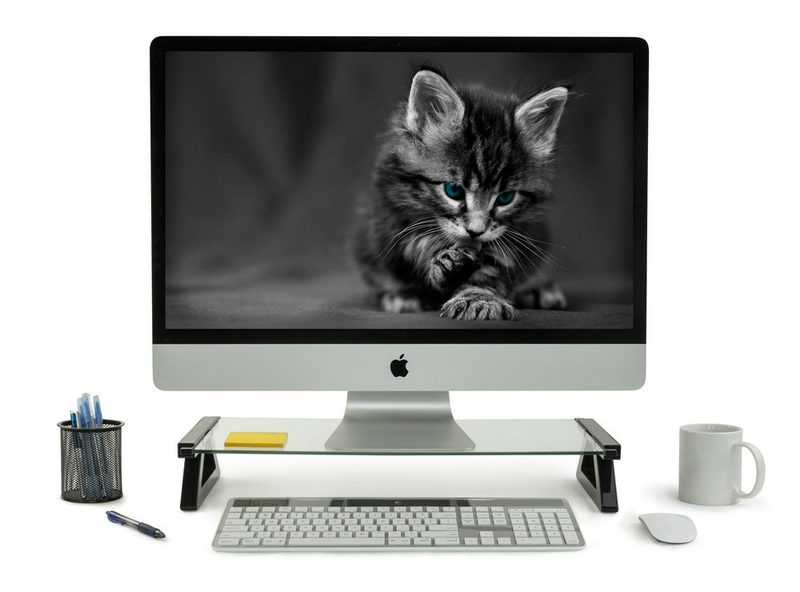 This stand can be used as a monitor, laptop/notebook stand or as an office desktop stand for PC and Apple computer monitors. It elevates displays by 3 3/8 inches. Creates an additional horizontal surface under the monitors to store your laptop, keyboard or other office related document or accessories. With this stand you can place your monitor on top of the shelf and store your keyboard or other office equipment underneath the glass platform. The glass shelf is 3/8 inches thick and when it is assembled measures 22 3/8 inches wide and 10 inches deep giving you enough space to place a computer monitor, laptop/notebook, flat display, printers, cable boxes, fax machines, other devices such as Apple monitor, gaming consoles, Blu-Ray players and other audio and video components. MI-7240 has two durable triangular legs and 3/8 inch thick plate glass that can hold up to 20 lbs. The weight capacity of this stand makes it sturdy enough for to support LCD and LED monitors. It also, has 3 built-in USB ports with a Y-Shaped power cord that can be used for transferring data or powering up additional USB devices. Most computer users complain of neck and back pain after sitting long hours in front of a computer monitor. Elevating the height of the computer monitor from the desktop level to a more ergonomic higher elevation might help alleviate the posture problems caused by incorrect monitor placement. You can use one or two of these stands to place additional monitors side by side for additional productivity.